Various parts of the world are becoming hotter, drier, and dustier—and when excess dust from these drylands gets lofted up into the atmosphere, it can alter rain and snow patterns on the other side of the world. Most people think about dust only once it’s settled — as something that needs to be cleaned from the surfaces of our homes, cars, and clothes. But when those fine particles are kicked up into the air en masse, dust can have significant effects on human health. It has been linked to respiratory illnesses like asthma and infectious diseases like meningitis and valley fever. It also turns out that bacteria, fungi, and even viruses can hitch a ride on dust particles traveling on wind gusts or jet streams—some of these particles end up traveling halfway around the globe. 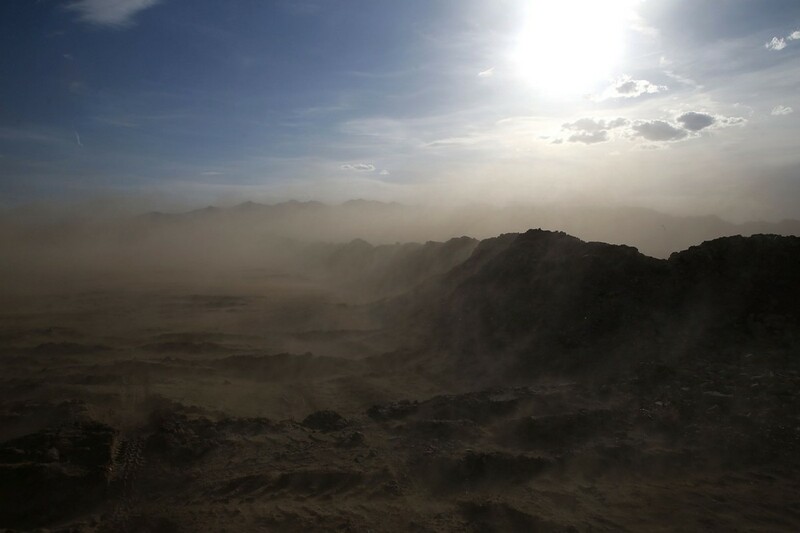 That extra dust in the atmosphere can also influence the Earth’s weather and climate — all the more concerning given that climate change could double the volume of dust floating around the atmosphere by the end of the century, Scripps researchers said at COP22. Just about all dust in the atmosphere can be traced back to drylands — regions with little rain and low humidity, like deserts, semi-deserts, grasslands, and rangelands. About 25 percent of the global population lives within these regions, which cover more than 40 percent of the Earth’s land surface. Climate models show that these regions are set to become hotter, drier, and dustier, according to Amato Evan, an assistant professor at the Scripps Institution of Oceanography. As temperatures rise across Earth’s surface, drylands will become ever more arid — prime conditions for the proliferation of deserts; rangelands will transition to grasslands, grasslands to semi-deserts, and semi-deserts will give way more deserts — the source for the vast majority of dust in the atmosphere. But you don’t have to live in the desert to be feel the effects of dust. Once it’s in the air, dust can travel around the globe in mere weeks. Dust storms can be massive, reaching heights of three miles above Earth’s surface and stretching clear across its oceans. “The very largest ones are the size of continents,” Evan told reporters on Wednesday. Once in the air, dust can have direct and indirect effects on climate and weather. Airborne particles can directly reflect sunlight back out into space or absorb incoming radiation; more indirectly, dust can interact with clouds or even seed cloud formation. These are known as aerosol-cloud interactions, and, through these, dust can affect a lot of outcomes—even the likelihood that a cloud will release its rain. So what effect will all that extra dust have on Earth’s weather and climate in the future? No one really knows — at least not yet. On a global scale, the direct effects of dust seem to decrease precipitation, but, on a cloud-by-cloud basis, dust can sometimes enhance rainfall, seeding cloud formation—or beefing up existing clouds—by providing a surface for condensation. Pretty much any airborne particle could do the same — soot, sea salt, pollen, and even tiny biological organisms can all trigger condensation. But dust particles in particular serve as ice-nucleators, i.e. surfaces that encourage water droplets to freeze. In clouds, water droplets can remain liquid down to about minus-38 degrees Celsius — well below the freezing point of water. Ice-nucleating dust particles can lower that threshold, encouraging ice to form at temperatures as warm as negative-15 degrees Celsius. (Some bacteria, like Pseudomonas syringae, are even better ice nucleators, triggering freezing at temperatures as high as negative-two degrees, and have been used to make snow at ski resorts.) All of this matters for rain because at least 60 percent of precipitation begins in the ice phase, so the more ice nucleation going on inside a cloud, the more likely it is to rain. Beall and her colleagues have been measuring how dust and other aerosols affect precipitation over the Western United States for several years. In 2011, the team compared a storm that contained mostly dust particles with another that contained mostly marine aerosols like sea salt. According to Beall, the storm with more dust produced 40 percent more precipitation and 60 percent more snowpack. It’s clear that dust can sometimes create rain, but, given that dust travels and clouds cover anywhere between 60 to 80 percent of the globe at any moment, there’s no guarantee that that rain will fall where or when we need it to.Pseudomonas syringae aside, most attempts to harness cloud-seeding particles to control the weather have not panned out.